Here is another Peaceful Wishes card. This one I made a little rustic -- is that the right word? I stamped the pine cones with Chocolate Chip Craft ink, and embossed them with Clear embossing powder. I think I am getting addicted to that technique LOL. Then I sponged around the image. I stamped the pine branches with artichoke -- stamped off once. I distressed all the edges. I asked hubby if he thought this could be a card for a guy -- you know use Happy Birthday instead of Happy Holidays -- well he just stared at me and did not say anything. So I guess that is a NO. This is fantastic! I love how you stamped on the designer paper. Very nice! I think it's a great guy card. It is gorgeous. That's a great card! I think it would make a wonderful "guy" card - no flowers, no fluff, but still very attractive. Awesome! Great card, love how you used the pine cones. This is very pretty! 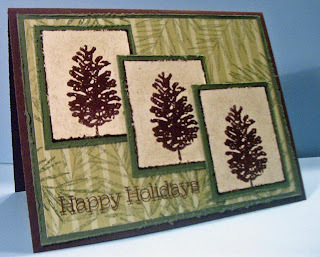 I love the boldness of the pinecones, and the beautiful pine needles on the designer paper in the background. I love outdoor-sie stuff (did I spell that right?! ha!) Great stamping! Oh, wow, what a great "guy" card! I love the design! I like what you did with the pinecone with this set. I have this set as well and I am always looking for new ideas of ways to use it. I also love your Peaceful Wishes card from an earlier post. girl, this totally can be a masculine card. too funny about your hubby. I love your creations and I check your blog every chance I get. Is there any way you could change the format of the blog, so that your newest creations appear at the beginning of the blog. Just a suggestion!! I love the background of stripes and gentle pine branches. What a beautiful card. You dod gordous work. Corie, I like how you stamped the branches onto the DP. Makes a very pretty background that ties in perfectly to the main images. Thanks for sharing. Wonderful card, Corie. And I definately think it could be used for a man! Funny story about your husband, sounds like something mine would do too. Very nice card! Corie, I love your "rustic" Peaceful Wishes card!! This would make a wonderful "guy" card! I love what you did with the PP! Just beautiful! Love your colours and your layout...and your use of the PP. I love it! I think it would work for a guy though especially an outdoorsy type guy! Maybe your DH was just speechless at it's beauty....;)! LOL! Thank you for sharing! Beautiful card Corie! I like how you stamped on the background piece. I keep meaning to try that but I keep forgetting. I am a Stampin' Up Demonstrator. If you want more information about Stampin’ UP!’s exciting products, please contact me. The tutorial for the puffy flowers can be found here. Samples of the puffy flowers can be found here. Are You Playing With The Operators? A GREAT new Challenge site -- Are you playing along? All content (including text, photographs, and design work) is © Corie Foster. All supplies are from Stampin' UP! unless otherwise stated. My artwork is shared only for your personal inspiration and may not be copied for publication or contest submission. The Internet, Blogs, Publications, etc have inspired me. In the beginning I CASEd (Copy and Share Everything) a lot, which is perfectly fine -- I encourage it. If you want to copy one of my cards to give to someone go right ahead, that's why they are here. If you are a Stampin' UP! demo and would like to use my card for a class or workshop that's OK too. Just please do not submit any of my original work to any contest or publication.